I’m sure you all remember the video, don’t you? 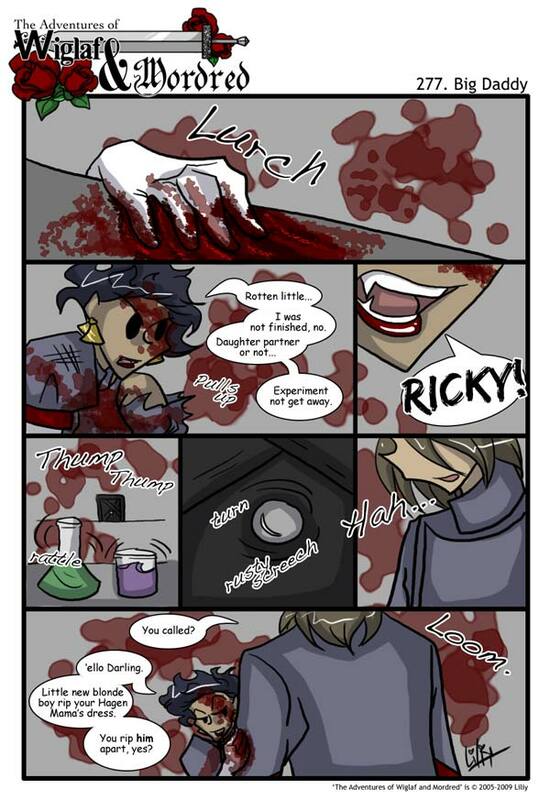 Liliy… one of these days I’m going to check this comic and die of laughter. Not to mention that the Canines in the second pannel are magnificent. yay! This is just becoming more fun by the minute! So Ricky the Teamkiller has some sort of a possessive thing for Hagen, huh? That’s going to be interesting. I guess I’ll have to wait for the color to see what sort of a possessive thing it is. You’ve been getting more and more creative with your panel arrangements, Liliy! :D I ADORE panel four. After all, “Big Daddy” could mean just about anything. Especially given Liliy’s enjoyment of the forties, yes? You know Liliy best, but given the demi-Slavic unstable genius femme fatale angle she seems to be playing up with Galen, I wasn’t sure that “darling” meant anything. I’ve seen them use “darling” in a condescending, “oh, aren’t you just the cutest thing” manner to sons-in-law before, in movies.